The writing was on the wall, and then it was gone. The trio with spray guns made sure of that. John Szachury and Ray Woody of The Sherwin-Williams Company, along with Greg Stallings of The Stallings Group, conducted a graffiti removal demonstration by applying Anti-Graffiti Coating® to a tagged building along Madison Avenue and subsequently utilizing a power washer to eliminate the paint. It was a fitting culmination to a graffiti workshop entitled “LEG UP Lakewood” (Let’s Erase Graffiti and UnPaint Lakewood). LakewoodAlive, the City of Lakewood and Sherwin-Williams teamed up to offer a Graffiti Workshop for merchants. 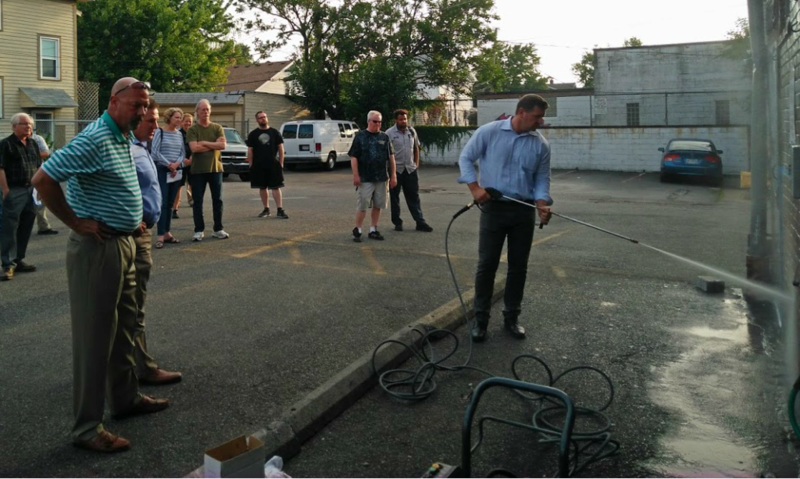 LakewoodAlive partnered with the City of Lakewood Housing & Building Department, the City of Lakewood Police Department and Sherwin-Williams to offer a free graffiti education workshop for business and building owners on July 28. 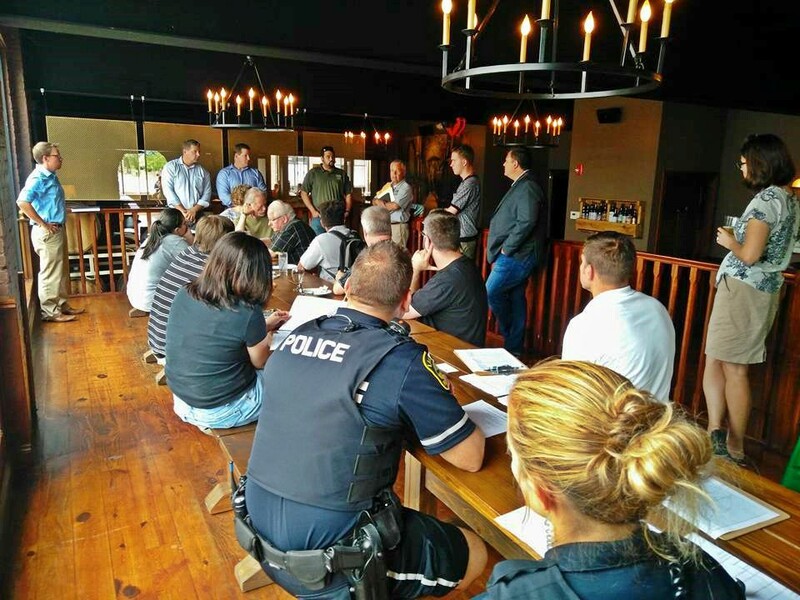 The workshop drew city leaders and merchants to The Bottlehouse Brewery Lakewood in an effort to bring the graffiti issue to light and explore potential solutions. LEG UP Lakewood kicked off with remarks by Justin Maskaluk and Kevin Kelley of the City of Lakewood’s Housing & Building Department. Kelley, a city building inspector, cited rapid removal as one of the most effective strategies for deterring future graffiti tagging. A study by the Los Angeles Police Department found that removal within 24 to 48 hours results in a nearly zero rate of reoccurrence. Officers Angela Ortiz and Matthew Wintrick of the Lakewood Police Department followed by discussing a range of graffiti topics as they pertain to law enforcement, including the value of business surveillance cameras and the effectiveness of graffiti removal community service as a disciplinary measure. The officers referenced the city’s “My Lakewood” mobile app as an easy way to report incidences of graffiti to the authorities complete with photographic evidence. The workshop was then handed over to Szachury, Woody and Stallings, who explained how most graffiti is entirely removable. The trio described the benefits of several removal products, including Sherwin-Williams’ Anti-Graffiti Coating® — a clear, one-coat applicant intended for use on concrete or steel surfaces. 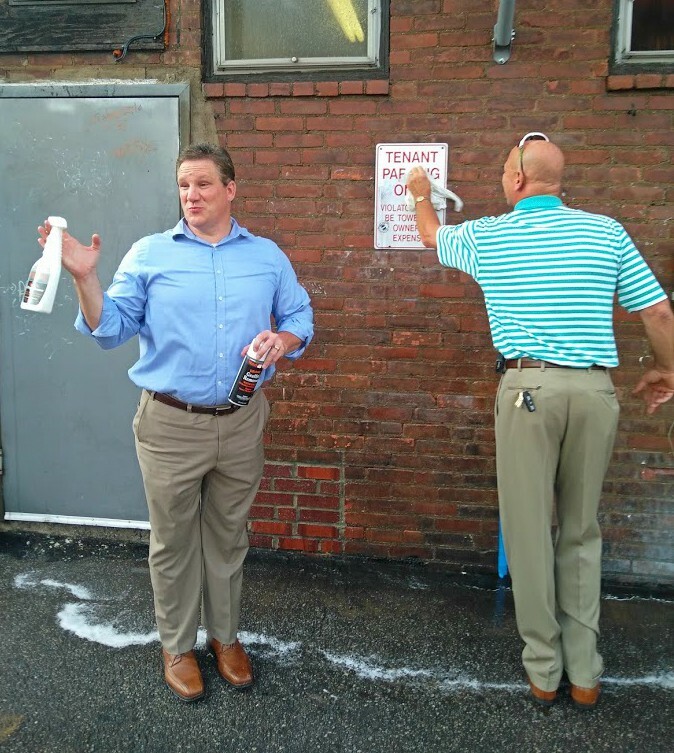 Following their presentation, the trio took the gathering outside to demonstrate the product’s effectiveness by removing graffiti tagging from a nearby building. 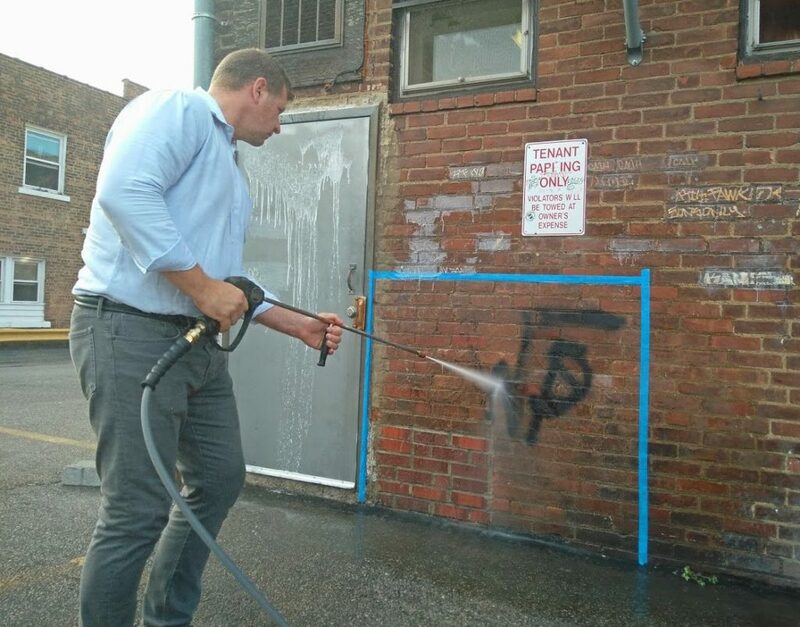 Although this workshop was solely for business and building owners, Lakewood residents will soon have an opportunity to participate in graffiti removal as well. LakewoodAlive will host a LEG UP Lakewood volunteer event in late September (date to be announced), harnessing the power of our community to help unpaint sections of our city. Lakewoodites interested in participating in this volunteer event can sign up here. For more information regarding the LEG UP Lakewood graffiti education workshop, please contact Allison Urbanek, LakewoodAlive’s Housing Outreach Director, at 216-521-0655 or aurbanek@lakewoodalive.com.